There is the cliché (and I love clichés because by their very nature they work) that we call: the artist and his (her, to be modern)model. What if we could find some sort of technology that when pointed at a painting like da Vinci’s La Gioconda, or at Van Gogh’s self-portrait could tell us the circumstances from the point of view of the subject of the painting? Not a chance! That would be speculative/fantasy science fiction and no more. But there is a variant that is possible but most rare. Consider the following: What if I told you that some canvases can speak of their experience of being painted? Argentine painter Juan Manuel Sánchez and his former wife Nora Patrich did not body paint as such. They used canvasses, paper and sculpture as their principal artistic medium. But in a few occasions (and luckily I was present to record it all) the two painted their visions on an undraped human being. No, not body painting. They transformed the real flesh and blood into a canvas of their imagination that could walk and speak. They imposed (gently) this vision on a naked body and the results were spectacular. I am hoping that I might convince some of these living paintings to tell us of their own account on how it felt to be transformed into someone else’s vision – a superimposition willingly executed. It’s a cliché, “There is a first time for everything.” The problem with that is the possible variation on each individual everything. As an example are early infatuations lesser versions of falling in love? I can remember all the women I was infatuated with beginning in my Buenos Aires kindergarten. Was my miss-a-heartbeat-every-second in the 8th grade infatuation with the delicious almond-eyed Anna María Ramos (7th grade) only that? Is falling in love (and I have done so four times since Miss Ramos) spectacular only on that first occasion? 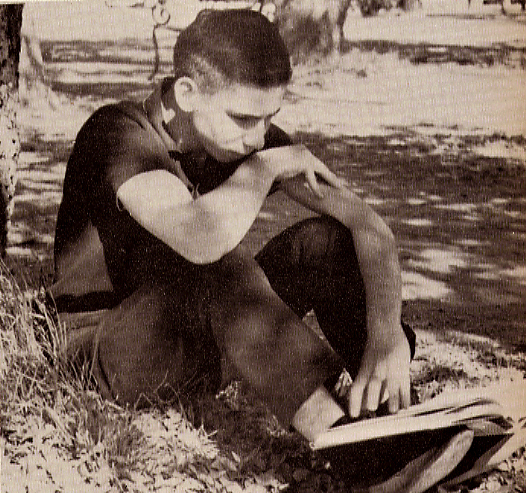 I remember vividly that day sometime in 1962 when my friend Robert Hijar at Mexico City College put a record on a turntable. It was Stan Getz/Charlie Byrd Jazz Samba. It was like nothing I had ever heard. Shortly after I discovered Zoot Sims’ New Beat – Bossa Nova and Bud Shank/Clare Fischer Bossa Nova Jazz Samba. Bossa nova has not been the same or as good (mostly insipid) since those first times and particularly that Getz/Byrd Jazz Samba. My adventure in first times of the sonic kind really began in Austin, Texas in 1960 at St. Ed’s High School. I was a boarder but a day student, William B. Schieffer (who drove a blue/green and white Nash Metropolitan and everybody made fun of it) told me, “Alex the best jazz quartet around is the Dave Brubeck Quartet. I suggest you go to their concert at the University of Texas next week.” I went and I was completely infatuated (?) with the sound which was a sound unlike any I had ever heard. I played the alto sax in the school band and even though I was a middle-of-the-road musician my sound with the horn was smooth and sweet. I was dully impressed by Paul Desmond. So after buying Shelly Manne’s Oodles ofNoodles (my first jazz albume in the 9th grade) my second one was Time Out in the 11th. I went back to Mexico in 1961 and in my Downbeat Magazine I read about the quartet’s Jazz Impressions of Eurasia. I wrote to a friend (who was in Austin but was returning to Mexico City) called Milton Hernandez to buy me the record. If I can discount my Gerry Mulligans, my Piazzollas, my Kind of Blue, then Jazz Impressions of Eurasia has to be my desert island album with Brandenburg Gate my favourite Dave Brubeck Quartet tune. So much for the first times. 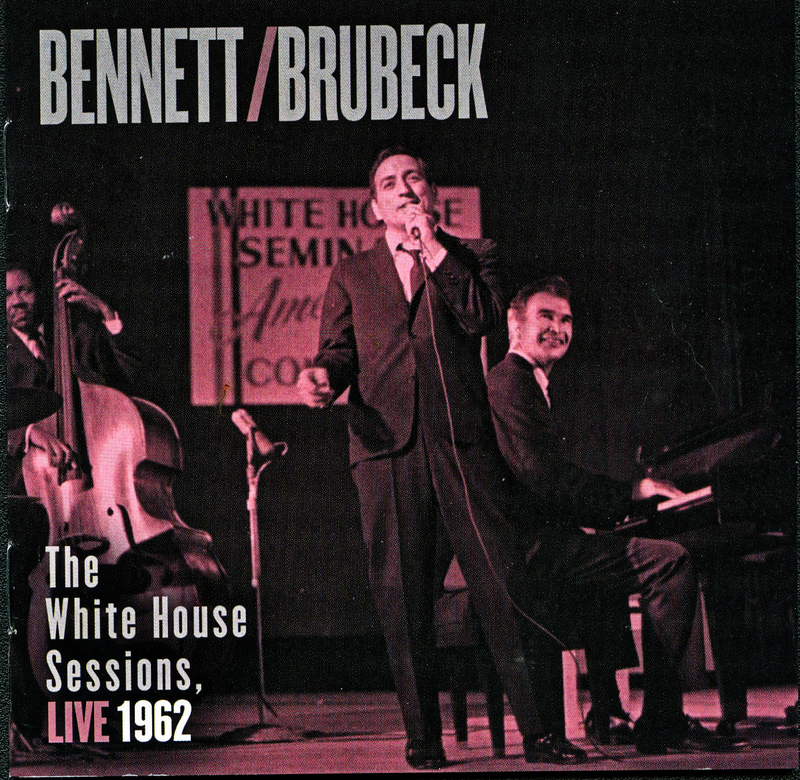 Then last week I go to my Kerrisdale London Drugs (we live in Kitsilano but we still like some of our old digs) and find Bennett/Brubeck – The White House Sessions, Live 1962. Few things get music fans more excited than the discovery of long-lost recordings from the past – especially if they present unique meetings between legendary artists. Too often, we lament projects that almost happened, but never took place, such as Jimi Hendrix’s planned collaboration with Miles Davis or Charlie Parker’s cancelled session with Art Tatum at Carnegie Hall. Or we speculate about recordings that may have been made- so we imagine- but never survived, such as the perhaps mythical Edison cylinder that captured the sound of the first great New Orleans jazz band, led by cornetist Buddy Bolden, circa 1900. Yet, every once in a while, an unexpected gift comes to us from the past. A long-distant event brought two great musical minds together on the same stage – and someone was wise enough to capture it for posterity. This recording presents just that kind of rare serendipitous moment. 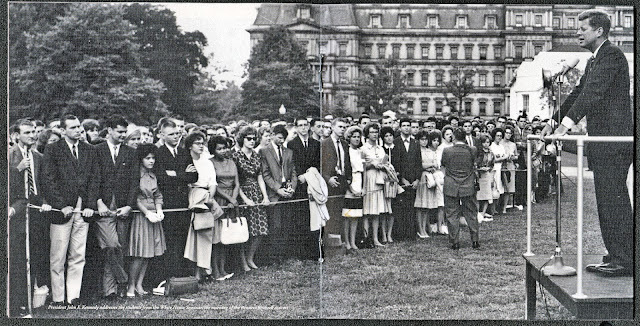 On Tuesday, August 29, 1962, two stars came together at the base of the Washington Monument. There at the Sylvan Theater, Tony Bennett and Dave Brubeck each performed separately, and then took a chance on a spontaneous, unrehearsed set – the only occasion, to my knowledge, when these two artists made music together, until they reunited at the 2009 newport Jazz Festival. I know that my friend John Lekich, a Tony Bennett fan extraordinaire will have a heart seizure when he reads it. I will not write about Bennet singing with his own band or with the Brubeck Quartet. I am going to write about the fact that sometimes you can hear something for the first time the second time around! I will post below the Take Five version from my new CD. It and Nomad (from Jazz Impressions of Eurasia) are played super-fast as if there were no tomorrow. To me they sounded as fresh as new. Then there is the Chopinesque Thank You (Djiekuje) from Jazz Impressions of Eurasia which was originally a piano solo. Here they whole quartet plays it. 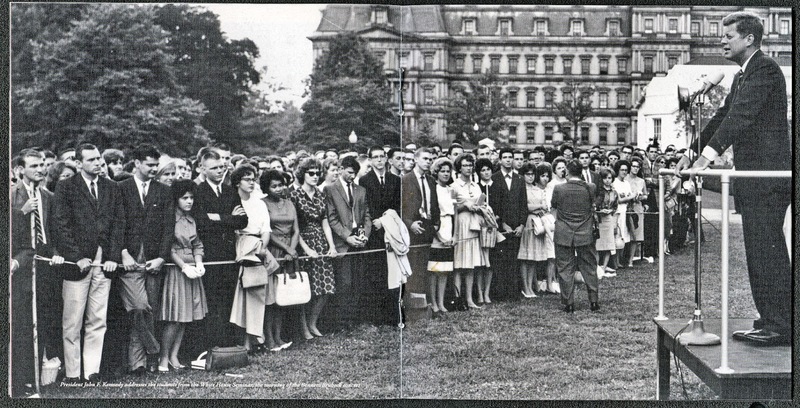 When I saw the long panoramic with President Kennedy on the right I was magically taken back to 1962, when all was possible in the world, when I could read Ian Flemings for the first time and a whole future of my youth was in front of me to explore. All that and more with one CD. Rosemary wasn’t entirely wrong as I soon developed a strong interest in roses and in particular old roses and English Roses. But I swore at that first meeting that I would never ever photograph roses or any other plants and flowers. Unfortunately I was hired by garden magazines to shoot gardens. This I did and I enjoyed using my 6x7cm format Mamiya RB-67 loaded with Kodak Ektachrome. It may have been 15 years ago when I happened to think about cutting a rose from my garden (Rosa ‘Reine Victoria’). It must have been beginner’s luck because the result after I scanned it on my flatbed scanner the results were breathtaking. Since then I have scanned most of the roses (over 90) of our garden plus just about every other flower of note. 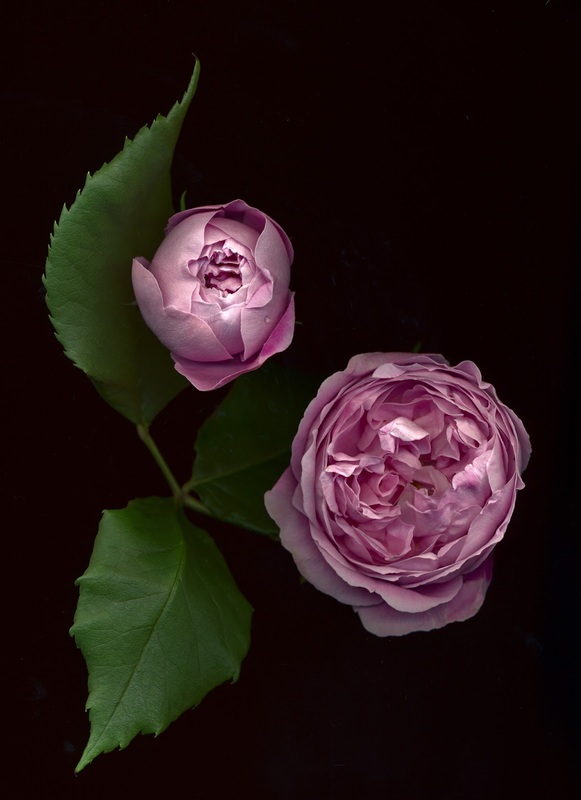 In many cases I will do scans of a rose through its flowering season and I can observe how size and colour varies with the season, sunlight or Vancouver rain. Today, December 6, 2016, I happened to look at our deck garden, (we left our large corner not garden 8 months ago. I brought two hydrangeas. One of them Hydrangea macrophylla ‘Ayesha’ like most other hydrangeas bloom in the summer. I leave the old spent flowers (they look pretty nice anyway) and I don’t cut them off until spring. The surprise is that on one little branch there was a brand new flower which will certainly not develop in size or colour as it snowed yesterday and there is more coming. And yet there is beauty in this scan. It is the beauty of a possibility not to be attained until next year. Meanwhile I will put the bloom in a vase inside. 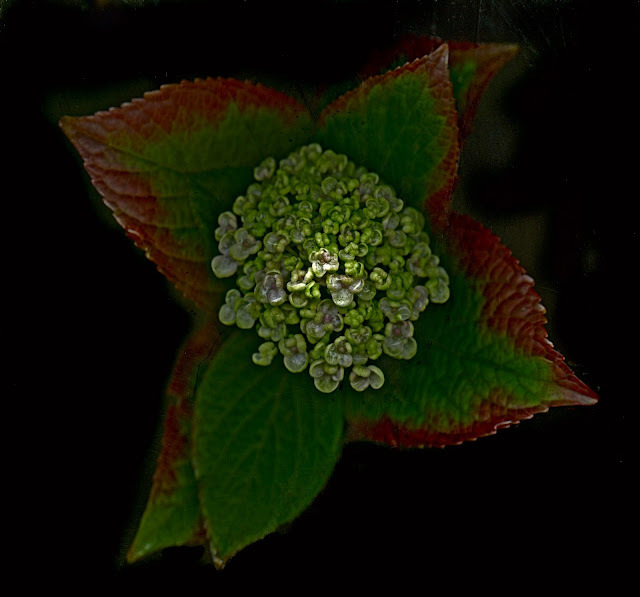 Hydrangea flowers last a long time in water. In 1928, Walter Diemer, an accountant for the Fleer Chewing Gum Company in Philadelphia, was experimenting with new gum recipes. One recipe was found to be less sticky than regular chewing gum, and stretched more easily. This gum became highly successful and was eventually named by the president of Fleer as Dubble Bubble because of its stretchy texture. The original bubble gum was pink in color because that was the only dye Diemer had on hand at the time and it was his favorite color. In modern chewing gum, if natural rubber such as chicle is used, it must pass several purity and cleanliness tests. However, most modern types of chewing gum use synthetic gum based materials. These materials allow for longer-lasting flavor, a better texture, and a reduction in tackiness. To the above I can only add that it was in Mexico where the Aztecs and the Mayans simultaneously discovered that the sap of a tree Manilkara zapota, commonly called the chicozapote was chewable,flexible and when thrown on a hard surface it bounced. These natives of Mexico used the sap to make the balls with which they played their game of pelota which used both the hands and the feet. Strictly speaking they invented chewing gum. It is only the chap at Fleer’s who may have discovered a more viscous version with which you could blow bubbles. My adventure with chewing gum began in 1951 when a distant cousin of mine Robby Miranda arrived in Buenos Aires with his family from Manila via New York City. It was cousin Robby who told me about the NY Yankees and the Brooklyn Dodgers when he proudly showed me his valuable pennants. He complained that Argentine chewing gum was defective as you could not blow bubbles. I did not understand. Soon after, my mother who worked at the American School in Belgrano R brought me some square little packages of gum called Fleer’s Double Bubble. I proudly showed Robby my find who then showed me a little package of gum called Bazooka. My mother told me that chewing gum was a useless pastime as our stomachs waited in anticipation for the food to come. Gastric juices were prepared and when nothing came down we would be subject to stomach troubles. She said I was cheating my stomach. I have not liked bubble gum since. When me moved from Buenos Aires to Mexico City in 1954 my new Mexican friends taught me to chew chapopote, the tar used between large squares of concrete on streets. They told me that chapopote helped to keep my teeth white. But I must admit that when Salem blew bubbles from her bed at the old Marble Arch (I was taking photographs, nothing more) I was suddenly charmed. When my Argentine painter friend, Juan Manuel Sánchez died a month ago in Buenos Aires I mourned not only the loss of a very good friend but also of a kindred spirit with whom I shared an obsession with the image of the undraped female. His advantage over me is that he could paint from memory. A photographer needs a real subject. When Sánchez and his wife Nora Patrich were living in Vancouver, BC (I still live here) I found many a woman who would pose for the three of us. We had a huge output of work. Now pretty well alone in a Vancouver that does not seem to appreciate the unfettered female figure and cites that often used word (here) of inappropriate I find that I too must live from my imagination. Unfortunately I cannot work with a canvas and brush as Sánchez did. Because of my age of 74 I find that my interest in women lies in women who are closer to my age, or at least over 40. The problem is finding a free spirit willing to pose in this age of perfection. The Fuji 3200 Instant b+w Print Film, its scanned negative peel, is now alas discontinued. Alex, April 20 1961, Austin, Texas - Photograph Brother Edwin Reggio, C.S.C. Consider the practical effects of the objects of your conception. Then, your conception of those effects is the whole of your conception of the object. Pragmatism rejects the idea that the function of thought is to describe, represent, or mirror reality. Instead, pragmatists consider thought an instrument or tool for prediction, problem solving and action. Pragmatists contend that most philosophical topics—such as the nature of knowledge, language, concepts, meaning, belief, and science—are all best viewed in terms of their practical uses and successes. The philosophy of pragmatism “emphasizes the practical application of ideas by acting on them to actually test them in human experiences”. Pragmatism focuses on a “changing universe rather than an unchanging one as the Idealists, Realists and Thomists had claimed”. I look at social media (Facebook and Twitter) and notice how people go at each other’s throats over politics, environmental issues and animal rights. These people are either on one side or the other. There seems to be no middle ground. It would seem that US political polarization happens in other countries and in all things. I remember exactly what I was doing during the Kennedy/Nixon debates and I remember, too the day after the ill-fated Bay of Pigs. I wrote about it here. It was at St. Edward’s High School that I learned first about Thomism (read the above excerpt on pragmatism from Wikipedia). St. Thomas Aquinas and St. Augustine were the two most important scholars not only of doctrine but of philosophy in the Roman Catholic Church. Brother Edwin Reggio, C.S.C. (MAs in music and mathematics) taught us religion (better if I use the more formal and wider term theology). Reggio taught us ethics (mentioning the Greeks in the process) logic (also the Greeks) and taught us stuff that I now recognize as philosophy. 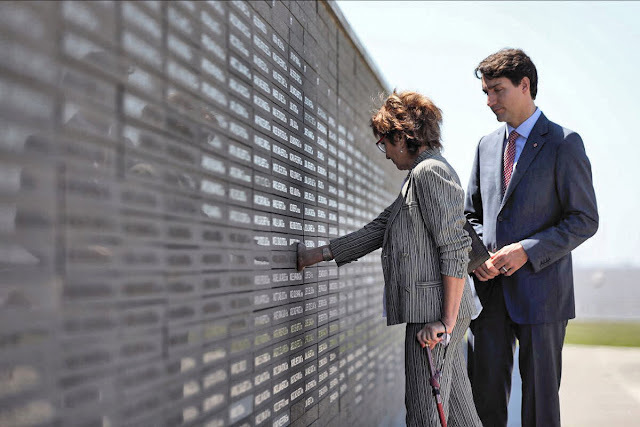 Even though he knew we were wasting time on purpose he played along when we would ask him when a venial sin became a mortal sin or delving into civics when a misdemeanour became a felony. We asked him if dogs had souls and at what point could an animal think. Our favourite time-waster was how much money you had to steal from an old lady before the venial sin became a mortal sin. Because of his math background he would explain to us the concept of (without us knowing that it was basic calculus) of infinitesimals and that at one point something became something else entirely somewhere in a mathematical infinity. You might at this point reject the idea of my having had a Roman Catholic education. But the fact is that Brother Edwin taught us how to think. It was when I was 21 that I so much enjoyed a basic philosophy class with professor Ramón Xirau at Mexico City College that I took many more courses. From Xirau I learned the philosophy of the Pre-Socratics to the man now ignored or reviled as he backed Hitler, Martin Heidegger. Xirau put special emphasis on the philosophy of Hegel and Kierkegaard so that a few years later I read more Hegel while in a Buenos Aires Argentine Navy brig (for insubordination). On my trip back after the navy to Mexico I read some Spengler. No I am no expert on philosophy. Most of it went in one side of me and out the other. But if anything it taught me to be pragmatic. Consider the people who justifiably (in Vancouver) do not want our Vancouver Aquarium to keep any more whales. It would be difficult to be against this. But there is something that I might call (others have coined it I am sure) Creeping Ethics. I broke my rule of not ranting or participating in a discussion on animal rights. I simply said (using our Brother Edwin waste/time tactics) if whales are seen as sentient beings we must first agree on what that definition is. Is an octopus (not as pretty as a beluga or a killer whale) a sentient being? It is very intelligent. How about those cute sea otters? Are they sentient? And I could go on and on with this silly logic. I was immediately rebuffed as those who read my points did not understand the purpose of it. And let’s now go to Castro. Some as my very good Argentine artist friend Nora Patrich,(who uses the very strong Spanish word militante to describe her left-wing philosophy which she has had for many years) thinks that Fidel Castro Rus (we in Argentina like to use Castro’s mother’s name too. Are we early feminists?) is next to God. She mentions Cuba’s excellent health system and boasts how Cuban children are all in school and never in the street. And then there are the folks on the other side who stress Fidel’s authoritarian methods and the fact that he was a very (very) rich man. And they also point out his jailing and systematic elimination (death perhaps?) of any who disagreed with his policies. We Canadians (many of us, anyway) have been lambasting Justin Trudeu for his eulogy on Fidel Castro. Any Argentine would recognize the post-Tito style and method of being a gadfly to the horse that is the United States of America. I would never post here my political views or opinions on the above but I would draw the line when my friend Patrich posts a photograph of Fidel Castro facing the then President of Argentina Néstor Kirchner as two great men of the century. As far as I could tell the only resemblance is that one of them was richer than the other. But enough of this and on to the other topic that could do well with a pragmatic approach. And this is oil. Few know that unless a bottle of vanilla has a label that says it is 100% vanilla that most vanilla (particularly in ice cream) is a petroleum bi-product. The amount of plastic in a green Prius or Volt is alarmingly high and that too is a petroleum bi-product. The same can be said for many of the synthetic clothing materials and the plastic shoes so popular in third world countries. The very panels to convert solar energy into electricity contain a lot of plastic. There must be a middle ground somewhere. And it is called pragmatism. But pragmatism now is a bidproduct of the death of philosophy in this 21st century. And how many people either pro or against Castro know of the delights of Ernesto Lecuona, Nicolás Guillén & Alejo Carpentier? The latter, is one of the formost novelists of Latin America in the past century a music critic who coined the term magic realism and was the Cuban Cultural Minister in Paris for you know who’s regime. And thanks to the loosening of relations between the US and Cuba (we in Canada got to see him live first) there is that tremendous jazz pianist Ernesto Rubalcava, who perhaps due to the isolation of his country from the world developed a style as original as that of Thelonious Monk. When I began to photograph Rebecca, my older granddaughter who is now 19) I never asked her to smile or laugh and to always look into the lens of my camera. Other members of the family, particularly her other grandparents wanted to know why in my portraits of the girls they never smiled or laughed. I tried to explain (to no avail) that the girls never volunteered to smile or laugh so that’s what I thought they wanted. I also explained that in the first photographs of children in the 19th century and particularly those of Julia Margaret Cameron they were serious for the camera. I further mentioned that children in Victorian times were treated as adults (to their detriment in their abuse in terrible working environments). To delve into Lewis Carol and his relationship with Alice Liddell would have complicated matters even more. I simply stuck to my purpose and photographed my granddaughters staring into my camera with a serious expression. I believe that to look into a person’s eyes is to get at a hint (life force, soul, spark) that makes them individuals and different from me. I know that looking into a mirror confirms my individuality and existence and that I am even alive. 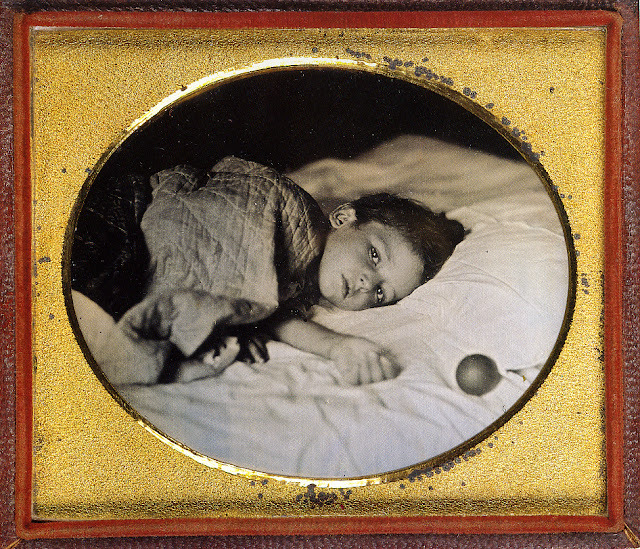 From Sleeping Beauty - Memorial Photography in America by Stanley Burns, M.D. With the discovery of photography in the early 19th century photographers (unable to apply what they knew about math with infinitesimals and asymptotes) thought that if they pointed their camera at a person about to die they might catch that moment between life and death. Of course they failed. 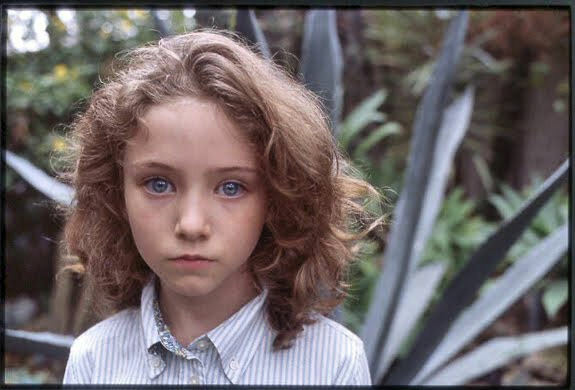 Both my granddaugthers, Rebecca and Lauren often look at the pictures of my Sleeping Beauty-Memoria Photography in America by Stanley Burns, M.D. 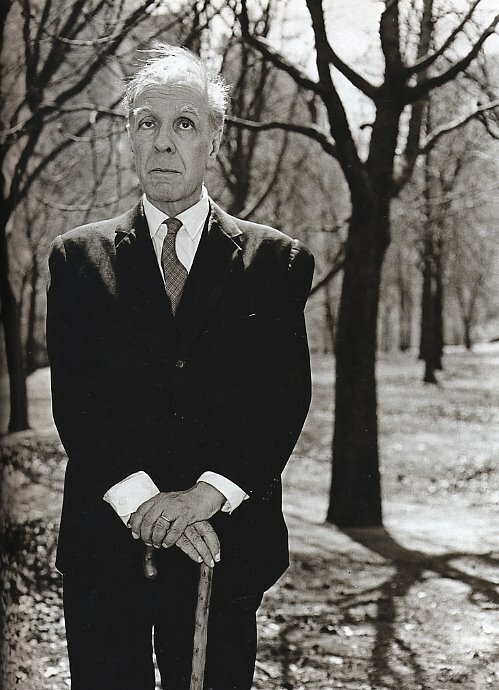 My confusion troubles me when I approach the idea of a blind man like my favourite Argentine poet Jorge Luís Borges who became blind at a young middle age. My confusion troubles me when I stare into the eyes of Rosemary’s cat, Casi-Casi. Can he think? Is he aware of his existence? At other times like many cats he does not want to be started at and looks away or closes his eyes. This is a similar reaction (looking away) when I would stare at my early attempts into finding if a girl liked me. If they were to stare back I would immediately act like Casi-Casi. There are many stories and superstitions in Latin America about a “mal hojo” and how such a person with an evil eye can cause you to experience unfortunate events. I have wanted for years to test a belief I have about how we look at people and how they do it in return. The experiment is to place a young person (20s) in a room and have the person facing a camera on a tripod with a simple light to one side that cannot be moved. Then one by one the person’s father, mother, dentist, brother or sister, boyfriend or girlfriend, teacher, etc would individually take one snap. I maintain that with some judicious examination of the photographs one would be able who took each picture if thrown to the floor in a jumble. A further thought for me in taking portraits is that no matter how objective we might be about a person we have met or not met we will have pre-conceived ideas on who and what they are like. Furthermore the person sitting for my portrait will hide what must be hidden and only show me what they think I should see in what and who they are. 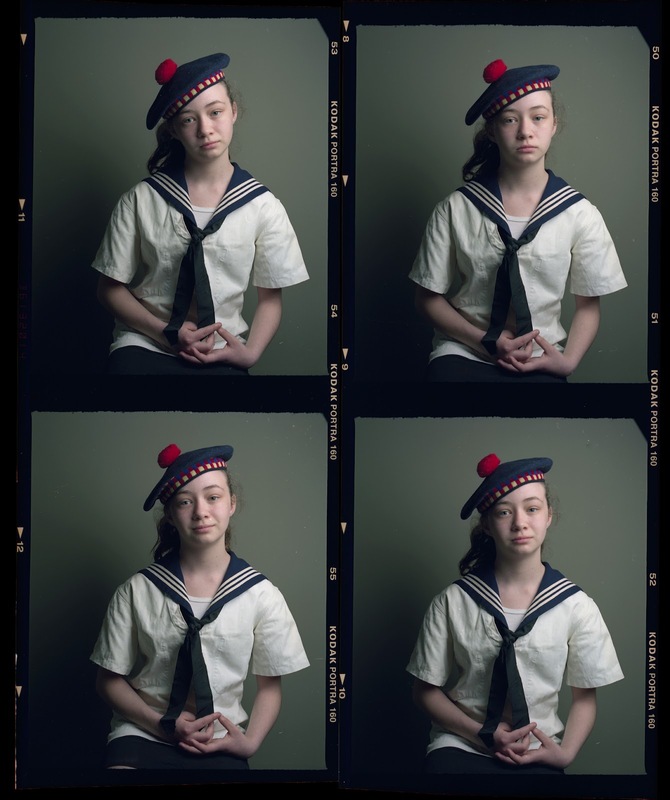 A good portrait has to be a blend, a collaboration between photographer and subject.